Visual evidence has shown that the architectural facades of the palaces and tombs of the Achaemenid Persian Empire (ca. 550-330 BCE) were richly decorated with color [1–5]. At both Pasargadae and Persepolis, designated UNESCO World Heritage sites since 1979 and 2004 respectively, stone reliefs, excavated fragments, and paper pulp squeezes of inscriptions taken by archaeologists in the early 20th century bear visible paint remnants, evidence of a vibrant palette used to finish the surfaces of the monuments. Among these are 40 fragments of painted plasters and glazed bricks housed today in the Freer Study Collection at the Smithsonian Institution in Washington, DC. The fragments were excavated by a team led by archaeologist Ernst Herzfeld in 1923 and 1928, and were donated to the Freer Gallery of Art in 1947. The ancient city of Pasargadae is located in the highland plain of Dasht-e Morghab (“Plain of the Waterbird”) in Fars in southwestern Iran. It was the first capital of the Achaemenid Persian Empire, founded by Cyrus the Great after 550 BCE, and the famed leader’s final resting place . 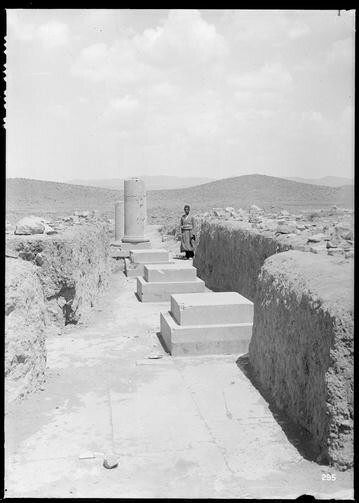 Palace P, Herzfeld’s “Palast mit dem Pfeiler,” from which the Pasargadae fragments in the Freer Study Collection originate, was first excavated with a series of narrow trenches in 1928 (Fig. 1). Fragments collected include twenty-two pieces of painted and unpainted earthen plaster. Persepolis, the prominent later capital of the Achaemenid Empire in Fars was founded by Darius I (c. 550–486 BCE) around 520 BCE, and is located 43 km southwest of Pasargadae, in the modern Marvdasht plain. The exact excavation location of the two painted fragments from a floor, and the six fragments of glazed brick from Persepolis can no longer be determined (Fig. 2). Both the painted fragments from Pasargadae and the glazed brick fragments from Persepolis were drawn in color in Herzfeld’s excavation notebooks, which are now part of the Ernst Herzfeld Papers, Free Gallery of Art| Arthur M. Sackler Gallery Archives [7, 8]. Analysis of the fragments was undertaken to document the materials and methods used to create the polychromatic finishes. Deterioration and friable paint layers made this work challenging. Comparison of Herzfeld’s excavation notes and photographs to the actual fragments shows that deterioration not only took place during burial and excavation, but is ongoing, as larger pieces continue to degrade and pigment particles are lost. Thus, documentation is imperative. Portable X-ray florescence (pXRF) was used as a non-destructive method to analyze the surface composition. Due to the deterioration of the surfaces and the inability to isolate paint layers, cross-sections were created using small samples of selected fragments, which were used to document the stratigraphies visually and with SEM/EDS. Many of the earthen plaster fragments excavated at palace P at Pasargadae are finished with paints. Two fragments have a single paint layer, whereas seven are finished with a geometric design of multiple colors which may have been applied to the columns in the central hall. The geometric designs have at least five distinct layers of colored finish above the plaster substrate (Fig. 3). The Pasargadae plasters and paints are distinct from the Persepolis floor material in texture, appearance and composition. A summary of the materials and colorants identified is provided in Tables 1 and 2. Freer study collection accession no. The Pasargadae paints were applied to a substrate of earthen plaster. The plaster is distinguished from the paint layers due to its thickness and presence of larger aggregate. While the current fragments’ plasters are up to 4 cm thick, the original thickness was much greater as seen in an image taken after excavation now located in the Freer archives (Fig. 4). The plaster is quite friable, compounded by voids left throughout the plaster due to the loss of degraded plant temper. This organic temper may have been composed of chaff or similar material added to reinforce the plaster and control shrinkage. The plaster from Pasargadae contains a fine-grained aggregate with all grains less than 0.25 mm and heterogeneous in color and shape surrounded by a brownish pink matrix. Analysis by pXRF identified iron, as well as calcium, strontium, copper and rubidium in two plaster fragments, likely from the clay binder as well as the aggregate. SEM/EDS of the four Pasargadae plaster cross-sections showed the characteristic elements of a mixture of clays including carbon, oxygen, magnesium, aluminum, silicon, potassium and calcium and iron. This indicates the presence of heterogeneous iron-containing clay, but not the type of clay. The clay likely acts as a binding material, and the iron gives the plaster a characteristic pink color. Seven of the earthen plaster fragments from Pasargadae are coated with a grayish yellow green paint layer that is 0.3–0.5 mm thick. Analysis by pXRF showed the presence of iron, copper, calcium and strontium. SEM/EDS analyses of all five Pasargadae plaster cross-sections revealed multiple fine sub-rounded particles up to 7 µm in diameter, composed primarily of magnesium, calcium and oxygen, and are consistent with dolomite. The particles are surrounded by a characteristic clay matrix of aluminum, magnesium, silicon, potassium, calcium, and iron. Most likely this layer is colored with the naturally green-tinted clay, montmorillonite. A similar paint was noted by Schmidt on the walls of the treasury at Persepolis that was found to be composed of clay . The similar wall treatment suggests the two Achaemenid cities shared their colors and techniques for decorating architecture. However, at Pasargadae, the grayish yellow green paint was covered with additional paint layers to create a decorative pattern. On five of the Pasargadae plaster fragments, a white layer was applied over the grayish yellow green layer. 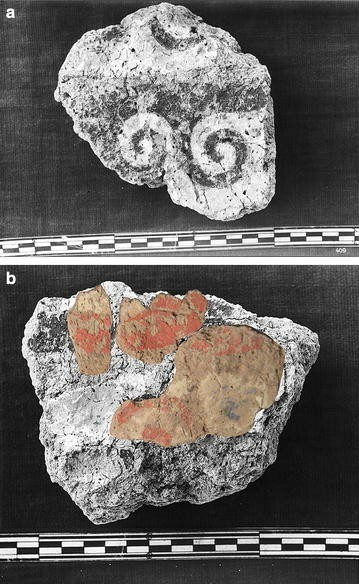 Herzfeld’s excavation notes indicated the white layer was an exposed part of a three-color design; however, the white on the fragments is covered with pink paint . 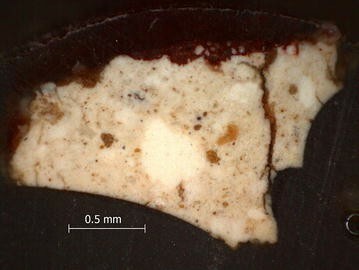 In cross-section the white layer was thin, 0.1–0.25 mm thick. SEM/EDS of the cross-section of fragment FSC-A-1i showed the platy morphology typically found in sheet silicates, as well as the presence of silicon, aluminum and calcium with trace amounts of potassium and magnesium. This evidence suggests the white paint is composed primarily of a mixture of muscovite and kaolinite. Two painted plaster fragments, FSC-A-3a and FSC-A-3b, were excavated at Persepolis and concluded by Herzfeld to be part of a floor. The finish paint layer is a deep red over a white layer on a pink plaster substrate. The plaster does not display voids indicative of a plant temper, but instead contains stone aggregate up to 0.75 cm in diameter. These stones would serve to control shrinkage, but also to impart compressive strength to the floor. 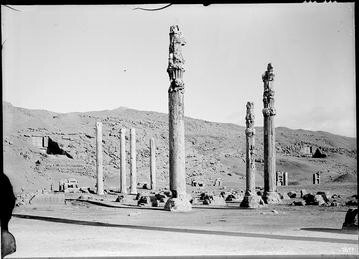 The Persepolis plasters have lost little to no visible surface area from the historic photographs and are considerably more stable than the plasters from Pasargadae. The craftsmen applied a white paint layer to the plasters at Persepolis, which was then covered with red paint. The Persepolis floor white is thicker than other paints examined in cross-section, measuring 2–5 mm and contains aggregate particles measuring up to about 0.5 mm in diameter as seen in fragment FSC-A-3a (Fig. 5). The thickness of this layer and large aggregate size indicate this layer was likely applied to create a smooth surface over the plaster on which to apply the paint. The yellowish white layer was identified by SEM/EDS as calcium carbonate based on the primary presence of calcium, carbon and oxygen. Other particles in the layer are high in silicon and oxygen, indicating quartz sand grains. The calcium carbonate binder appears to be the product of a lime cycle, during which a limestone is crushed and burned to create lime, calcium oxide. The lime is then mixed with water to make a slaked lime paste that is applied to the building where it can slowly absorb carbon dioxide from the air and return to calcium carbonate. Crushing and burning the stone is a labor and fuel intensive process, requiring much more effort than the creation of clay plasters, but the resulting finish is more durable. Recent excavations west of the platform of Persepolis uncovered evidence of a kiln in which burnt animal bones produced a ground material which was likely used to create an additional white paint on the terrace complex [10, 11]. Three distinct red colored pigments were analyzed during this study. Both the moderate red as well as a light yellowish pink can be seen in fragment FSC-A-1d from Pasargadae. 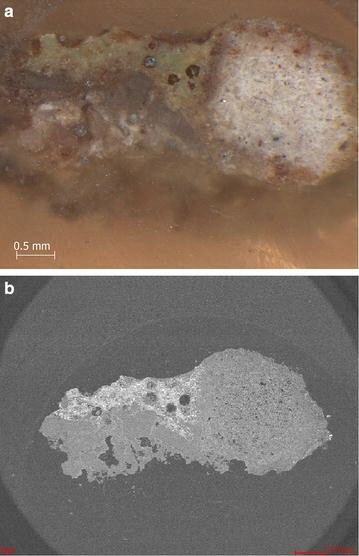 The dark red from the floor fragment was found to contain high levels of iron by both pXRF and SEM/EDS, suggesting that the pigment used was hematite. This paint was applied as a thick paint layer (0.5–1 mm) with aggregate to give it strength over the white lime plaster. Hematite has also been identified on lime plaster floors in the Palace of Darius at Persepolis, and on limestone masonry in non-visible areas at both Persepolis and Pasargadae . It has been suggested that hematite, an abundant and inexpensive pigment, was used to create guidelines for builders placing stone . The use of various analytical techniques—Raman microprobe, XRD, pXRF and SEM/EDS have obtained similar results supporting hematite as a common pigment in the Achaemenid Persian world. The moderate red color is still vibrant on sixteen fragments of earthen plasters from Pasargadae. The layer thickness of the red paint in cross-section is 5 µm or less. The pigment’s particle size is approximately 1–3 µm, with many voids between the particles. The red paint likely had an organic binder that has deteriorated leaving only a fragile layer of pigment particles behind. Analysis by pXRF showed this paint layer has a high mercury content. Iron was identified as well, although it was only slightly higher than the iron content in the earthen plaster substrate. SEM/EDS analysis identified strong peaks for mercury and sulfur in almost equal atomic proportions, indicating the pigment is cinnabar, or mercuric sulfide (HgS), a naturally-occurring mineral. Cinnabar has been previously identified as a pigment at both Persepolis and Pasargadae . A light yellowish pink paint layer was found in the Pasargadae geometric design’s stratigraphy. Analysis by pXRF indicated copper, iron, calcium, strontium, mercury and rubidium. In cross-section the layer is less than 0.5 mm thick with sub-elongate particles less than 1 µm in diameter. The SEM/EDS data showed the strong presence of iron-rich areas, likely the source of the light red color. The presence of aluminum, silicon, and magnesium in the SEM/EDS indicates the presence of clay. The results suggest this layer was a naturally occurring pink clayey soil. The clay and hematite (Fe2O3) mixture in this paint suggest it can be categorized as red ocher. Not enough information was available to identify the type of clay present, although the elemental composition suggests the clay of the illite- or smectite-groups, rather than kaolinite. Six earthen plaster fragments from Pasargadae displayed traces of a moderate blue paint. In the geometric design the blue paint was exclusively applied over the light yellowish pink paint layer discussed earlier. Additional fragments from Pasargadae have remains of blue paint—some with a homogeneous blue and another with a mixture of green and blue particles. Analysis by XRF was conducted on the blue from the geometric design and the fragment with a homogeneous blue layer–FSC-A-1f. Both blues appeared similar with the presence of copper, iron and calcium. SEM/EDS of pigment particles in cross-sections indicated calcium, copper, silicon and oxygen in the atomic ratio of approximately 1:1:5:10 which is close to the calcium copper silicate formula of the mineral cuprorivaite, CaCuSi4O10 known as Egyptian blue. This material is quite durable as a pigment, and will not react to acids or oxidize to a different color like azurite oxidizes to green malachite . Significant as the first known synthetic pigment, Egyptian blue was created by mixing silica, lime, copper and an alkali, likely using a two phase firing process . This blue pigment has been previously identified at three locations in Persepolis [3, 9], but this is the first time it has been identified at Pasargadae. 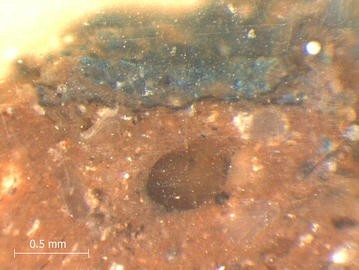 In cross-section, a black layer was revealed underneath the blue paint, less than 5 µm thick (Fig. 6). It was observed in two cross-sections taken from FSC-A-1i, which did not appear to be a part of the geometric design. The black colorant is likely carbon from readily available soot from the burning of organic materials. We hypothesized that this layer was used as a primer layer to darken the blue paint layer above it, or that it was a guide line used to trace a pattern. The fact that it was found in two separate cross-sections suggests the former. Only one fragment from Pasargadae, FSC-A-3c, had moderate yellowish green pigment and it was mixed with a moderate blue pigment, similar to the blue found elsewhere. Under magnification the green particles did not form a continuous paint layer, but instead consisted of tiny patches of pigment particles on the plaster indicating that most if not all the binder had been lost. Compositional analysis by pXRF was conducted on an area where the blue and green particles were mixed and another area that was mainly green. Comparison of the areas revealed identical peaks for iron and calcium, likely from the plaster substrate, and copper. SEM/EDS analysis of green pigment particles showed the presence of copper, carbon and oxygen, indicating the green pigment is the mineral malachite [Cu2CO3(OH)2]. Particles could be seen with SEM/EDS to be associated with quartz as overgrowths, indicating that the malachite is of natural origin, rather than a synthetic pigment. One possible geologic source of the malachite is the copper mines recently excavated in the Fars Province of Iran . Malachite has previously been identified as a pigment at Persepolis  but further research would be required to investigate the geologic origin of the malachite. The blue and the green particles were thoroughly mixed, and it was not possible to ascertain with reflected light microscopy if the green was above the blue, underneath it or possibly a product of oxidation of the blue. Even though blue azurite naturally oxidizes to malachite, elemental analysis showed that the blue was Egyptian blue, not azurite, indicating that the two pigments were originally distinct colors. Based on the lack of apparent stratigraphy using SEM, it can be postulated that the malachite green and blue pigments were intentionally mixed to create a blue and green color. The ancient Near East has a long tradition of glazing architectural bricks, traced to the time of Kassite rule of the Iranian highlands from 1750 to 1170 BCE  and the 4th millennium BCE in Egypt . In the Achaemenid world glazed bricks were prevalent in lowland Susa, where the raw materials for brick making are abundant. Archaeological evidence suggests that Susa in the heartland of Elam had a long tradition in glazing technologies . Recent years have seen increased interest in research on glazed bricks excavated at Late Babylonian materials from Babylon and Borsippa in the Mesopotamian heartlands still visible during Achaemenid rule [16–18]. While the city of Achaemenid Susa was an important center of Achaemenid Persia, textual evidence suggests brick makers in the city at the time of Darius I were Babylonian [14, 19]. Furthermore, Egyptian craftsmen have been employed in the construction of Persepolis . These examples of foreign artisans at Achaemenid Persian sites warrant further investigation of the relationships of the materials and technologies to other locations in the ancient Near East. Ancient Near East glazes typically contain varying amounts of lime, natron or plant ash, silica and inorganic colorants. Common additives include lead as a flux and calcium antimonate as an opacifier. A flux is a non-coloring metallic oxide that lowers the melting temperature of the glaze and reacts when heated with acidic ingredients to produce glass. The opacifier makes the glaze less translucent. The alkaline content gives it clarity and brightness. Matson and others have shown that the alkalis used in the ancient Near East were created from plant ashes, and the resulting composition would vary widely depending on the type of plant burned . These are also easily lost in a burial environment. Four glazed brick fragments excavated by Herzfeld from Persepolis were analyzed, and a summary of their cross-sections and identified glaze colorants is given in Tables 3 and 4. The fragments are too thin to be structural bricks (approx. 1–1.5 cm) although the original depth of the intact bricks is not known. They may have been decorative tiles applied to a structural surface. 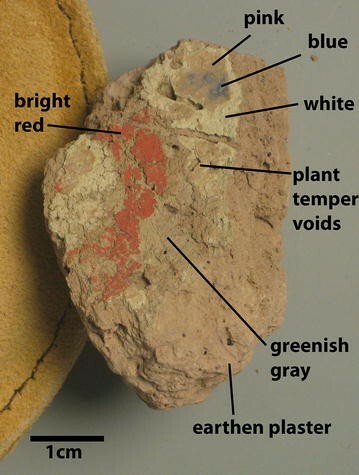 The fired brick bodies are covered with colored glazes separated from each other by raised lines as seen on brick fragment FSC-A-3d (Fig. 7). The composition of all four brick bodies is consistent with the silica-rich, clay-poor fired material similar to faience. The lack of lead as a flux indicates that the firing temperature of the brick body would have been higher than that of the colored glazes. However, the fragments are too small to determine their decorative scheme. Previous research has shown that the brick bodies from Achaemenid sites differ from the composition of bricks in the Mesopotamia region. Glazed wall plaques from neo-Assyrian sites and bricks from the neo-Babylonian period of Babylon were made with calcareous clays likely from the alluvial sediments between the Tigris and Euphrates [16, 21, 22]. In contrast, Achaemenid bricks were made in the faience technique , created by mixing sand or powdered quartz with lime or limestone and alkali in the form of natron or plant ashes [13, 23]. A previous study of bricks from Persepolis suggested they were faience due to a composition low in alumina indicating a lack of clay in the body , as was also found in this study. The faience technology likely originated from Elam. Twelve glazed bricks from Elam were identified as faience by Caubet using pXRF, with less than 1.7 % alumina and less than 2 % iron oxides, in contrast to bricks from Assyria and Babylon with 12–14 % alumina and 4–7 % iron oxides . However, analysis of other brick bodies from Achaemenid Susa, the historic capital of Elam identified clays in the brick bodies [24, 25]. More research is needed to understand the use and cultural implications of faience technology across the Achaemenid empire. Raised lines on the surface of the brick bodies separate colored fields of glaze. These are consistently 2 mm in thickness, but vary in height depending on the level of deterioration. They appear white to light gray in color. The white line can be seen in the cross section of FSC-A-3e (Fig. 8). Microscopic examination of the raised lines in cross-section showed they are a distinct material in texture and particle size as compared to the brick body and the colored glazes. 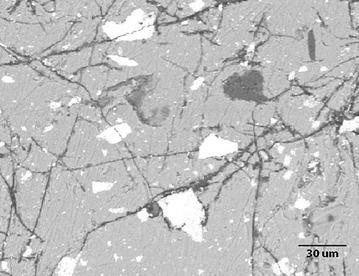 SEM/EDS analysis of the white raised line showed typical clay elements such as silicon, oxygen, magnesium, and calcium whereas the gray line on fragment FSC-A-3d contained additional elements of lead, copper, and iron. Low lead levels in both raised lines suggest they would have had a higher melting point than the colored glazes. All flat glazes between the raised lines were found to contain lead as a flux. In this case, the glazes would become liquid upon firing at lower temperatures and spread between the raised lines which would have remained solid, acting as an enclosure. This technique has been documented at Susa [23, 24, 25]. All colored glazes were deteriorated with surface loss, chemical deterioration and cracking at a microscopic level. Indents on the surfaces are likely from bubbles within the glaze created during firing. Deterioration of the glaze surface has exposed the bubbles and left an indented, rough surface that traps dust. Additional complications from previous repairs completed before their arrival at the Freer such as yellowed adhesive and gray parge encourage deterioration. The pale yellow glaze on fragment FSC-A-3d was analyzed with pXRF and SEM–EDS in cross-section. The tests indicated the presence of lead, antimony, silicon and oxygen. The coloring agent was probably yellow lead antimonate, which is consistent with other studies conducted on ancient Near East yellow glazes. Previously studied yellow glazes, without exception, were found to contain lead antimonate, which acted as a colorant and an opacifier [14, 16, 17, 22–24, 26, 27]. Like a pigment, these opaque antimonate particles are bound in a matrix of glass that contains lead and silica (Fig. 9). 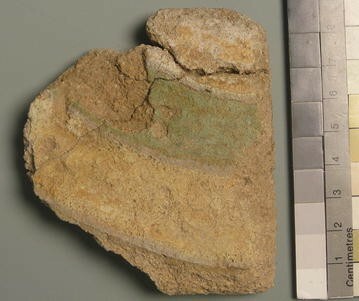 A moderate yellowish green colored glaze is present on one brick fragment FSC-A-3d from Persepolis. The glaze was found to be up to 0.4 mm thick, although it would have been thicker in its original state. Lead, copper, antimony, strontium, iron and calcium were found by pXRF in the glaze. SEM/EDS analysis confirmed the presence of a significant amount of copper as a glaze coloring agent. Yellow lead antimonate particles in the green matrix presumably added as an opacifier and to give a deeper green color to the copper oxide which would appear more turquoise without it. Underneath the green glaze a large silica sand grain (1 mm in length) that may be the remnant of an engobe layer (Fig. 10). Many other studies analysis of both turquoise and green glaze have found copper as the colorant including Achaemenid Susa [23–25], Neo-Assyrian Khorsabad , Nineveh , and Neo-Babylonian Babylon . The white glazed brick fragment FSC-A-3e is heavily deteriorated, but the presence of oxygen, antimony, lead and calcium found by SEM/EDS suggests the presence of calcium antimonate as well as particles of lead antimonate. Calcium antimonate would act as a white colorant and the lead antimonate as an opacifier. 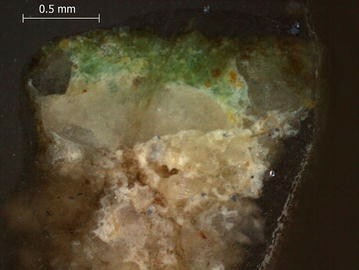 Similar to the green glaze, the white glaze was separated from the brick body by particles of unreacted silica up to 1.5 mm in length that appear to be part of an engobe layer. Calcium antimonate has also been found as a white glaze colorant in Achaemenid Susa , neo-Babylonian Babylon , and both neo-Assyrian sites of Nimrud , and Nineveh . One study of Achaemenid Susa brick fragments found sodium antimonate as a white colorant . The composition of fragments of painted plasters and glazed bricks studied here offers a glimpse of the decorative finishes of Pasargadae and Persepolis. Our research builds upon previous studies focusing on the analysis of materials excavated at Achaemenid Persian sites, including recent research on decorated materials from Susa. While our understanding of the state-of-the-art technology used in Iran between the mid-sixth and late fourth centuries BCE has much improved in recent years, fragments excavated over 88 years ago still have the potential to yield valuable insights. The study of archival material presents the opportunity to re-address unresolved questions and open up new research inquiries. These findings reinforce pigments, glazes and plasters previously identified at Achaemenid sites and demonstrate the connectedness of the appearance of monumental architecture across the Achaemenid Empire. Many questions still remain. Why and when were faience bricks used and what are the cultural implications of the use of different brick technologies? What are the geologic sources of the pigments and colorants and can they be connected with better preserved painted and glazed fragments from Susa and Mesopotamian sites such as Babylon and Borsippa? Traces of deteriorated finishes offer a small window into the colors and designs employed on a large structure, but their fragility exemplifies the need to document them as much as possible. The characterization of the micro-structure and identification of deterioration will inform the fragments’ long-term preservation at the FSG. Only recently, an entire facade of glazed bricks has been excavated near the Persepolis citadel , highlighting the need for conservation of the newly excavated Achaemenid finishes. By the examination and documentation of architectural finishes, this study strives to fulfill one of the objectives of Herzfeld’s initial excavation plans’ and more recent calls to protect and preserve the fragile Achaemenid remains at the sites of Pasargadae and Persepolis [6, 29]. pXRF was used as a rapid, qualitative, and non-invasive method for identifying elemental composition of the surfaces of the fragments. A Bruker Tracer III–IV handheld pXRF instrument was used with an accelerating voltage of 40 kV, and a collection time of 90 s.
Cross-sections of select small samples (<3 mm length) were prepared according to a method that requires minimal sampling . The samples were embedded in Tra-Bond F113 epoxy, sectioned, and dry polished with silicon carbide grinding paper to minimize loss of water-soluble particles. Particularly porous samples were consolidated with cyanoacrylate during the polishing process as necessary. Finished cross-sections were photographed using a Leica EC3 camera mounted on a Wild Heerbrugg optical microscope using reflected light at magnifications of 12–50×, and a Leica DMLM optical microscope from 50–200× in reflected and ultraviolet light. The cross-sections were carbon-coated for SEM/EDS, and the analysis carried out with a FEI/Philips TMP XL30 SEM equipped with EDAX Genesis EDS at 25 kV, and a probe current of 10 nA. Petrographic analysis was done with the Leica DMLM optical microscope in transmitted light. Optical dispersions of detached pigment particles in polarized light were used to verify the identification of cinnabar, hematite and malachite pigments. Potential for further analysis of the painted plaster fragments might include using imaging techniques to detect the luminescence of Egyptian blue  and its spatial occurrence on the fragments. EA studied the fragments, performed the analyses, undertook data interpretation, and drafted the manuscript. JD oversaw data acquisition, contributed to data interpretation as well as revised the paper. AN contributed to the study concept, historical background, and revised the paper. All authors read and approved the final manuscript. The authors would like to thank Blythe McCarthy, Senior Scientist in the Department of Conservation and Scientific Research, Freer Gallery of Art and Arthur M. Sackler Gallery, for her helpful discussion and support for this project. Thanks to Melvin Wachowiak, Senior Conservator at the Smithsonian’s Museum Conservation Institute who assisted with cross-section preparation and microphotography. The authors also express their gratitude to the F|S Archives for historic images and Richard Livingston for suggestions to the manuscript. Fellowship funding for this 2-month research project (January/February 2013) was provided by the Smithsonian Office of Fellowships and Internships, the Smithsonian’s Freer Gallery of Art and Arthur M. Sackler Gallery, and the Smithsonian’s Museum Conservation Institute. Askari-Chaverdi A, Callieri P, Gondet S. Tol-e Ajori, a new monumental building in Parsa. Preliminary cross interpretations from recent surveys and excavations works around Persepolis (2005–2012), ARTA. 2013: 1–40. [online available at http://www.achemenet.com/document/ARTA_2013.006-Askari-Callieri-Gondet.pdf]. Verri G, Collins P, Ambers J, Sweek T. Simpson SJ. Assyrian colours: pigments on a neo-Assyrian relief of a parade horse, British Museum Technical Research Bulletin, vol. 3. 2009. http://www.britishmuseum.org/PDF/BMTRB%203%20Verri%20et%20al.pdf.